Classic FM takes a look at some of the young musicians who achieved great things before they hit 18. Go on, be inspired! A true example of a child prodigy, the young composer could pick out tunes on the piano at the age of three, and began composing by age four. 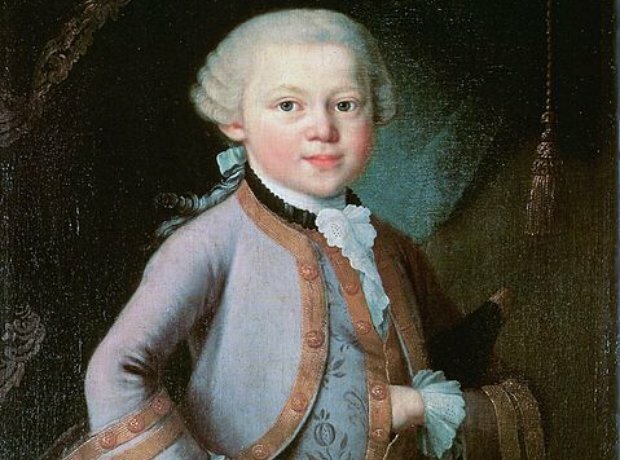 By the time he was 12, he had clocked up 10 symphonies and performed for royalty. Beethoven was indeed a child star – but not quite as good as his father wanted him to be! He was only seven when he gave his first public performance, but that’s not what the concert posters said. His father lied about Beethoven’s date of birth so the audience would think he more of a prodigy than he actually was. He's pictured here aged 13. Born in 1941, pianist Martha Argerich took up the piano aged 5, and was soon hailed as a prodigy, performing in public. In the space of three weeks in 1957, she won the Geneva International Music Competition and the Ferruccio Busoni International Competition. Not bad for a 16-year-old. Getting a place at a music conservatory is hard enough for an adult, but Claudio Arrau was studying piano at the Stern Conservatory of Berlin before he even hit eleven. But Claudio was no ordinary musician – he learnt to read music before he could read letters. Sarah Chang had recorded her first studio album, ‘Debut’, by the time she was 11 years old. She’d already been playing for six years, auditioned for the prestigious Juilliard School, and made her professional debut performing Paganini’s Violin Concerto No. 1 with the New York Philharmonic. You may recognise Daniel Barenboim from the conductor’s podium, but his musical education started at the piano. He gave his first formal recital aged just 7 years old, but it wasn’t long until he excelled in conducting as well, taking lessons in Salzburg aged 11. The minimum age of entry for the Paris Conservatoire was ten years old. Even that sounds pretty young, but Georges Bizet’s parents were so sure of his musical genius that they sent him there before he even hit his tenth birthday. The Russian pianist began his studies at Gnessin School of Music for Gifted Children when he was six, and by the time he was ten he had made his performance debut with the Ulyanovsk Symphony Orchestra. He’d even recorded his first album of Chopin’s piano concertos by the time he was 12, in 1984. She might have migrated to singing pop music, but Charlotte Church wowed audiences with her operatic voice at just 11 years old. Her debut album, Voice of an Angel was released the following year, and she’d even written an autobiography by the time she was 14. Legend has it that Bellini could sing arias before he’d even hit age two. He started playing the piano at five, but his most enduring works are from his later years, between age 29 and 33. Is there no end to Lang Lang’s talent? It’s astounding to think he started playing at the age of two, and was winning international competitions just eleven years later. Liszt wrote some fiendishly difficult piano music, but he had a lot of time to perfect his writing style – he’d been composing since he was eight. It’s not certain when his first piece was published, but it was probably around his 12th birthday. Barber composed his poignant classic Adagio for Strings at the age of 26, but his penchant for penning tear-jerkers began early. He composed his first piece, Sadness, when he was seven – a 23 bar piece in C minor. Not content with writing his first composition for piano at the age of five, Prokofiev had written his first opera by the time he was nine. He wrote the libretto himself, and it was based on children’s games he played with his friends. The second of four children, Felix Mendelssohn followed in his sister’s musical footsteps (and seemingly copied her hairstyle), taking piano lessons from his mother at the age of six. He and his sister Fanny moved to Berlin with his family to study music theory. Celebrated violin virtuoso Niccolò Paganini began his musical education as a mandolin player, starting lessons at the age of five. He took up the violin when he was seven, and went on to become one of the world’s most famous violinists ever to have lived. When Mahler heard Korngold’s cantata, Gold, he described the composer as a musical genius. Korngold went on to compose his first opera, Der Schneemann, at age 12, and his first orchestral overture Schauspiel Ouverture by the time he was 14. Perfect pitch, and a mastery of Latin – Saint-Saëns was precocious, even for a child prodigy. His first piece, written when he was just three, is now in the Bibliothèque nationale in France. After taking up the violin aged four, Anne Akiko Meyers debuted with an orchestra at the age of seven. By the time she was 12, she debuted with the New York Philharmonic and had already featured on US television. She signed a record deal four years later. Chopin’s began producing his beautiful piano music at the age of seven, composing two Polonaises, one in G minor and the other in B flat major. It’s not really surprising, looking at his musical family: his father played the flute and violin, and his mother played the piano to a high standard. Young Holst learnt the violin and the piano when he was a child, and started composing at the age of 12 - he even learnt the trombone in the hope it might cure his asthma. His mother was a singer and violinist. He’s best known for his best-selling recording of Vivaldi’s The Four Seasons with the English Chamber Orchestra in 1989, but violinist Nigel Kennedy started his musical career as a keen jazz fan. He’d often pick out tunes from by Fats Waller after listening to his stepfather’s records. There are few cellists who can say they’ve performed for the US President. Cellist Yo-Yo Ma performed for John F. Kennedy and Dwight D. Eisenhower at the age of 7. George Gershwin first displayed an interest in music at the age of ten, when he went to a violin recital. His parents bought a piano for his older brother, but George surprised them by experimenting on it. When Haydn's parents noticed their six-year-old son was musically gifted, it was tinged with a hint of sadness. In his hometown of Rohrau, he didn't have much opportunity to be trained, so they sent him to live with a relative, Johann Matthias Frankh, the schoolmaster and choirmaster in Hainburg. He never lived with his parents again.